If you’re looking for an easy way to soundproof a room, blankets might be exactly what you need. In fact, using blankets is, without a doubt, one of the easiest and most affordable ways to soundproof a room. Even a regular blanket should help reduce echo and absorb noise. As long as it’s thick and dense, a blanket could be put anywhere – walls, windows, and doors. You could even use it on floors and ceilings if you want. However, there are better techniques for those surfaces. In this article, I’ll explain exactly where you can use blankets and exactly how you can do it. Luckily, people have actually been using blankets to soundproof and insulate their homes forever. So, we have a wealth of experience to draw on. Actually, even musicians use blankets to improve sound quality in their recording studios. Young singers who don’t have studios have been known to line their closets with blankets before shutting themselves inside with their microphone to record their tracks. But really, there’s no need to deprive yourself of oxygen. The same effect can be achieved in just about any room. Before we get into how it can be done, I’d like to take the time to suggest a specific type of blanket you could use. However, you should keep in mind that this can be done with any blanket or thick quilt, though it might take some layering. Of course, if you want to achieve some more substantial results, you really ought to use soundproof or moving blankets instead of stacking any old blankets you get your hands on. Since I’ve written about them before, you may already know the difference between the two. Essentially, people use moving blankets to protect furniture during transportation. Since they need to be thick in order to provide proper padding, they’re also excellent soundproofing materials. After manufacturers noticed that audiophiles were already using blankets – moving or otherwise – to soundproof spaces, they started making soundproof blankets. These products turned out to be much more efficient. Many even come with grommets, so you don’t need to cut or drill into them before putting them up. So how can you get your hands on one of these blankets? Well, of course, you’ll easily find them online by simply searching for them on online retailer sites. I did review some of the best ones on the market in the article linked above. And if none of them suit your needs, I also included a short buyer’s guide to get you started. Other than online, you may also look for acoustic blankets at your local home improvement store. They may be somewhat new to the soundproofing world, but you should still be able to find them in stores. If not, you can always request that the store owner stocks them in the future. Without further ado, here are some quick and easy ways to use blankets, soundproof or not, to improve the sound quality in a room. Some of these ways may include having to use a hammer and nails or a nail gun. Or, you may want to have some sort of strong adhesive, or mounting putty, close at hand. So, if you don’t have those tools already, you might want to borrow or buy them beforehand. Of these, the most permanent option is obviously to nail it to the wall. And if you choose to nail your blankets, you should make sure not to push the nail all the way into the wall. Leaving the nail somewhat exposed will make it easier to remove when you don’t need soundproofing anymore. Or, you could just want to wash the blanket, though they should be fine if you just vacuum them once in a while. However, many people don’t have permission to modify their walls. In that case, even glue may be risky. I’d actually recommend suspending the blanket on a curtain rod – getting a blanket with metal grommets would be helpful. However you decide to go about it, it would be best to position the first blanket in the center of the wall. If it doesn’t reach all the ceiling or floor, it would still be okay, since the largest surface would be covered. And if you only got one soundproof or moving blanket, you can use other old blankets to soundproof the exposed wall on the sides. Doors can be notoriously hard to soundproof, though there are many ways you could do it. Many of them have huge gaps all around them which allow air – and consequently, sound – to travel. However, I’ve personally had great success using blankets on doors. Obviously, the first option will cause the least damage to your door or wall. However, your door won’t be completely covered. In addition, many doors don’t have gaps large enough for the blanket to fit through, and most won’t be able to close with a bulky blanket on them. Gluing or nailing the blanket to the door is a bit better, though I’d make sure to get a blanket that’s only a bit larger than the door. After you glue it, you should have some extra blanket on the sides, on top, and sliding on the floor. That should help seal the gaps somewhat. And if you don’t plan to open the door, you can also nail the blanket to the surrounding walls. Of course, installing a curtain holder or tracks will be the best option if you want to be able to move the door. When all else, including soundproof curtains, fails, you can easily switch to soundproof blankets to soundproof your windows. You could simply hang them up, just like curtains. And unlike my previous two suggestions, you wouldn’t even have to install a new curtain holder. Like always, hanging the blanket up will be much easier if the blanket comes with grommets. For a more complete sound canceling experience, you’ll need to cover as much of the window as possible. Just like with doors, the main thing that causes windows to let sound in, even when you close them, are air gaps. If a window isn’t properly sealed, you could cover it entirely with a blanket and nail the blanket all along the surrounding walls. However, that is obviously not the best option if you want to let the light into the room. So, I’d actually recommend checking out some other window soundproofing methods before you resort to this one. Still, having blankets over your windows temporarily, if you’re recording audio, for example, will do wonders for sound quality. 2.4. What About Floors or Ceilings? Honestly, while you could technically use blankets to soundproof, or at least improve the acoustics of floors and ceilings, I wouldn’t recommend it. They’d work fine enough, and laying a blanket on the floor is just about the easiest thing you could do. However, nailing one to the ceiling would be much harder than, say, putting up soundproof foam panels or other similar materials for ceilings. Similarly, there are many more effective and appropriate ways to soundproof a floor than laying down some blankets. Besides, having blankets on the floor may put you in the mood for a picnic. That’s not a bad thing, of course, though it’s certainly not a permanent solution. So, before you turn your home into a hippie’s dream, perhaps look into other floor and ceiling soundproofing solutions. Many people use soundproof blankets to cover some of their louder appliances. And yes, you could do this. However, I feel that I should caution you to read the appliance instructions before you cover it up. Some of them, like heating appliances, may not react well to being covered up. Still, I’d say you could cover dishwashers, laundry machines, and fridges without an issue. If you wanted to do that, you could either just unceremoniously lay the blanket over the machine, or make some aesthetic adjustments. For example, if you wanted to lay a blanket over your dishwasher, you might have to deal with a whole lot of extra material. You can snip the extras off of a bigger blanket and maybe even trim the edges neatly. So, your whole machine will be enveloped, and it won’t impact its effectiveness. And you could try similar things with bigger appliances like refrigerators. Just check if you’re allowed to safely cover the device, first. Finally, as you know, any hard surface will allow sound waves to bounce. So, if you’re looking to improve the sound quality in a room that has a huge hardwood table in the middle, or even a grand piano, you may consider covering them up. As with any of these steps, any blanket will soften noise, though thick and dense soundproof blankets are obviously the best choice. However, having a blanket on a table may not look as good as you’d like it to. So, you can either look for attractive blankets or cover them up with another tablecloth. And you may even want to cover your leather furniture with blankets since leather is also likely to cause more echo than softer materials. 3. So Should You Use Blankets to Soundproof a Room? 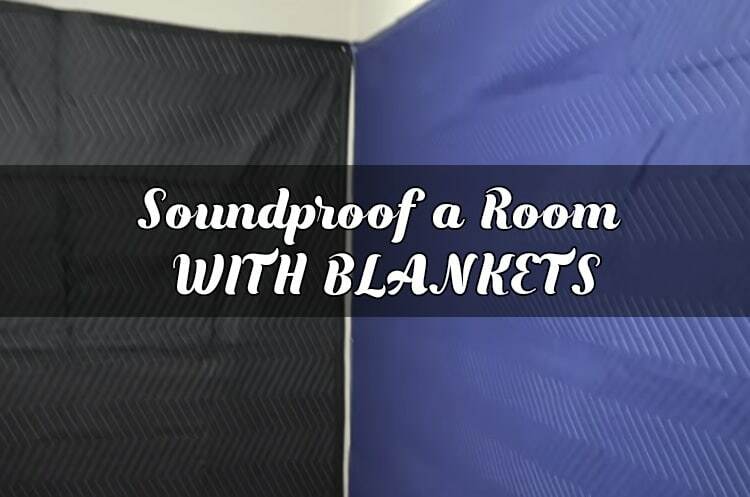 In my opinion, soundproofing a room with blankets is a great idea, especially since they don’t take up as much space as many other acoustic materials. In fact, you can even style the blankets and have them look like a part of the décor. Also, unlike many other acoustic materials, you can (and probably should) wash blankets. After all, they’ll soak up about as much dust as your curtains do. Most of the soundproof blanket applications I mentioned would benefit from working with a blanket that already has grommets. However, as many cheaper blankets don’t, you can also easily pierce the blanket and apply metal grommets yourself. Hopefully, this article has clued you in to some of the many ways you can use blankets to soundproof a space. And I’m sure you’ll even be able to invent some new ones yourself!